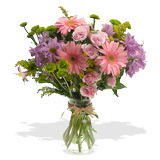 $65 - $80 Flower Bouquets FlowerFresh is based in Miami which is the flower capital of the US. The very fact that we are based in the hive of the flower activity means that our customers benefit from quick and efficient service. The ordering and sending process is extremely quick and easy. Whatever fresh flower bouquets tickles your fancy, whether it is spring flower bouquets or even just an assortment of fresh flower bouquets, they will be delivered on the date requested and in pristine conditions. Spring flower bouquets make a lovely decoration in the home. Try and pick a flower style and color that best matches the recipient. So when picking flower bouquet keep in mind your recipients personality type, age, as well as their favorite hobbies or colors if you know them well enough. If you are sending flowers for a particular occasion – browse through the flowers by occasion section that already divides different flower bouquets appropriate for specific occasions. If you are getting flowers for an event or for decoration browse the category section, that divides the flower arrangements and flower bouquets by floral design style, such as modern, color coordinated or tropical. You may also browse all our flower color sections where all the flower bouquets are sorted by a specific color.